Custom copper necklace colored with patina, Swarovski crystal and adjustable 24" curb chain with a lobster clasp. Wear the necklace shorter by hooking the clasp into any chain link. The stamped copper piece is 1" square and the colored piece is .075" square. Both pieces are slightly curved to add dimension. 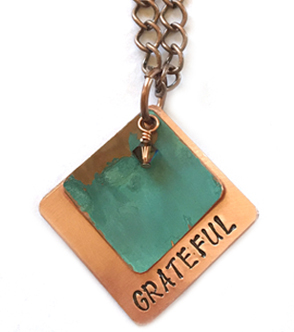 Pick from our list of words or customize your necklace with your own word or name.